According to a published report, today 25 solar-powered charging stations will pop up in the 5 boroughs of New York City in parks, beaches and other open spaces courtesy of AT&T. It's all part of a program being conducted by a partnership made up of the carrier and the City. Each station can charge 6 devices at one time no matter which carrier powers the units. There will be dedicated ports for the Apple iPhone, Android, BlackBerry and a standard USB connector. 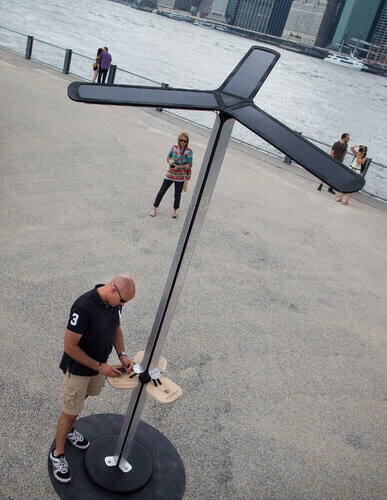 Each station consists of a 12.5 foot steel pole with 3 solar panels fanning out from the top and will be seen in locations like Union Square Park and Rockaway Beach for three to four weeks at a time until October comes. The chargers will rotate locations with areas like Orchard Beach in the Bronx, Pier 59, Coney Island and the Staten Island Zoo. The project will cost $300,000 to $500,000 and the idea for the project came after AT&T brought cellular towers on wheels and diesel generators to parts of the city devastated by Hurricane Sandy. The stations each contain three 15 watt solar panels and a 168-watt-hour lithium ion battery pack which keeps the station operating throughout the night or 5 days without sunshine. 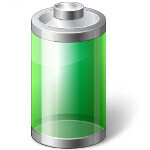 Users can recharge a smartphone in two hours, or grab a quick 30% charge in 30 minutes. If the testing works out well, AT&T will bring the solar-powered charging stations to other states. I wouldn't stray too far from my charging phone on one of these in NYC...better yet, it's not even worth the risk.